The final entry in the Shattered Sea trilogy will keep you turning the pages! 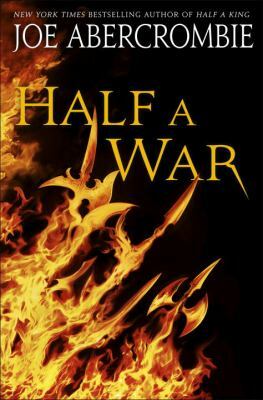 While you could have read the second book without reading the first, I recommend that you read the first two (Half a King and Half the World) before starting this book. The stories of Yarvi and Thorn are at the forefront once again as the High King’s army kills the king of their ally Throvenland. Yet one royal escapes Throvenland, Princess Skara, and her gentle way unites the armies building up to fight against the High King. Only half a war is fought on the battlefield the rest is words, deception and manipulation. Will our three heroes come out of the war unscathed in body as well as soul? I have shied away from epic fantasy for a while because I didn’t want to get sucked into a story that lasts for multiple volumes, each one long enough that it seems like three books in one. This series is different. It is definitely a trilogy (it ends) and all three volumes are less than 1,000 pages combined. It is also very different from any other fantasy I’ve read. The writing is spare, the world seems to be ours at a point in the very distant future and the unexpected happens all the time. This is war after all and sometimes the actions, deaths and betrayals are completely unexpected. If you are missing Game of Thrones and want to get completely absorbed in a fantasy story and still have plenty of time to refresh yourself in Westeros, try the Shattered Sea.